Summers tend to go by quickly, but this summer flew by. I have hard time to believe it is almost over. We were very busy with too many projects going on at our backyard homestead and two graduates, one now a new college student getting ready to leave us soon. Still, it was a good summer and we are enjoying farm fresh foods that we have been able to grow and raise in our backyard and farm garden. Let’s start with the farm garden. 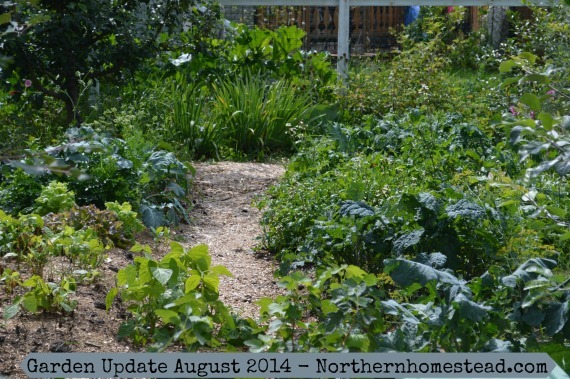 Even though the farm garden is just out of town, it did not get hit by the hail we got in early July. But it did get too much rain all throughout our unusually wet summer. 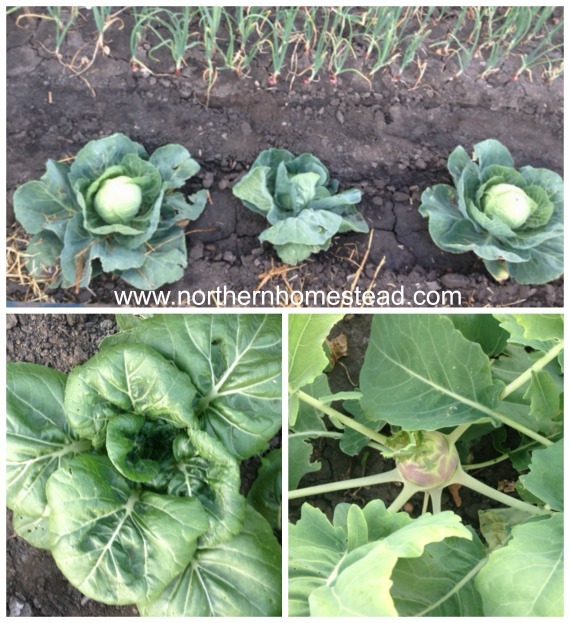 The root crops did not like the oversupply of moisture so much, but cabbage family plants have done well. At our home garden we are using the Back to Eden garden method, and cover the soil with mulch. It really stood out to me at the farm garden how much the soil is begging for a covering. With all the rain it was very hard and cracked open even early in the season. 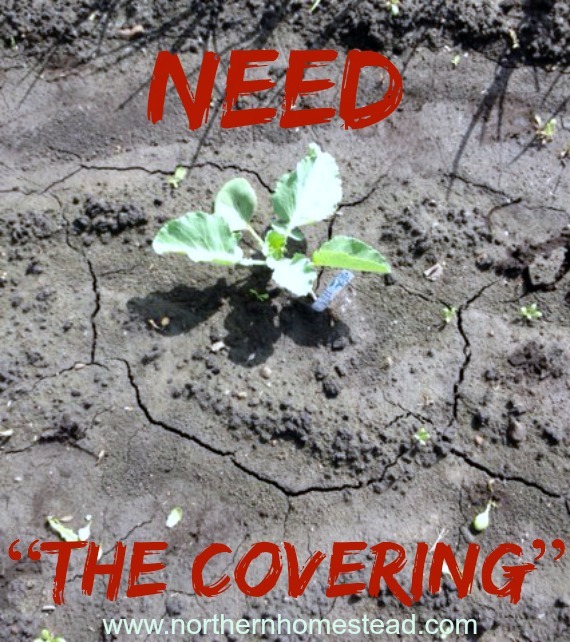 The “covering” is the most important feature for a garden. Plus, most of the time the farm garden was too wet to even access it. Not a problem at home where the ground is covered with wood chips. We LOVE the Back to Eden garden method. For the first time we are trying to hill potatoes with straw instead of earth. We planted the potatoes as per usual about 4 inch deep and about a foot apart. Then, once it was time to hill them, we put straw all around them. Our hope is to have less backbreaking digging to do. We will keep you posted. At home the garden has gone rampant, I’m thankful for chickens to eat the surplus of greens. They really like it and are laying lots of yummy eggs. I, however, struggle with the way it is going. I totally get it, speaking in terms of permaculture, the growing together makes sense. 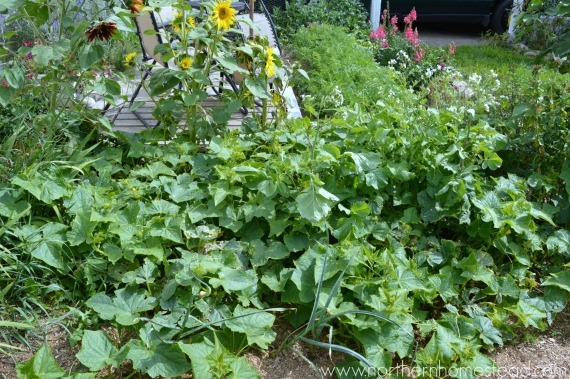 Just look at those cucumbers next to the sunflowers surrounding the (going to seed) radishes. Awesome! As long as you do not have to go into it and find some cucumbers ;). I think I am more the organized gardener, and maybe would do better with some lined garden rows or boxes. Some decisions we have to make here for the future. All in all we are very pleased with our first-year garden here. Lots more to plan and to do. Excited for next summer! And now, last but not least – August flowers. 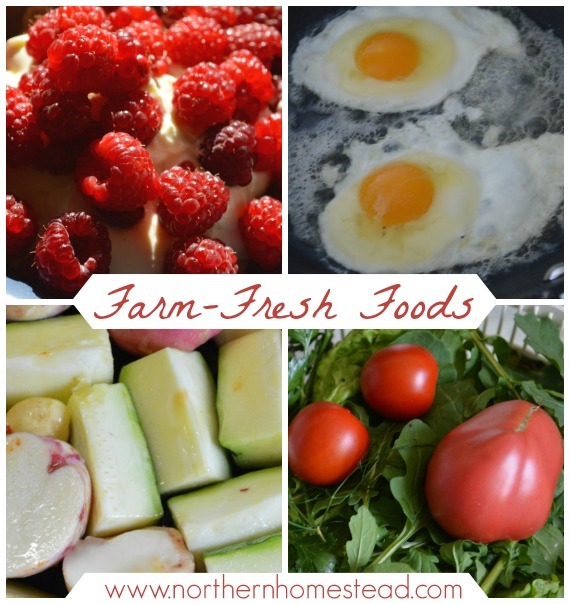 We invite you to subscribe to NorthernHomestead and follow us on Facebook or Pinterest for the latest update. 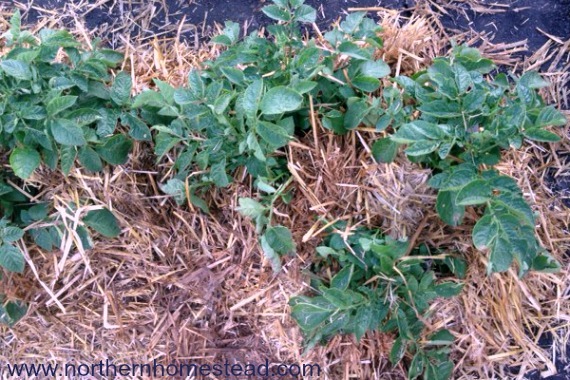 That’s interesting about covering your potatoes in straw – can’t wait to see how they come out. 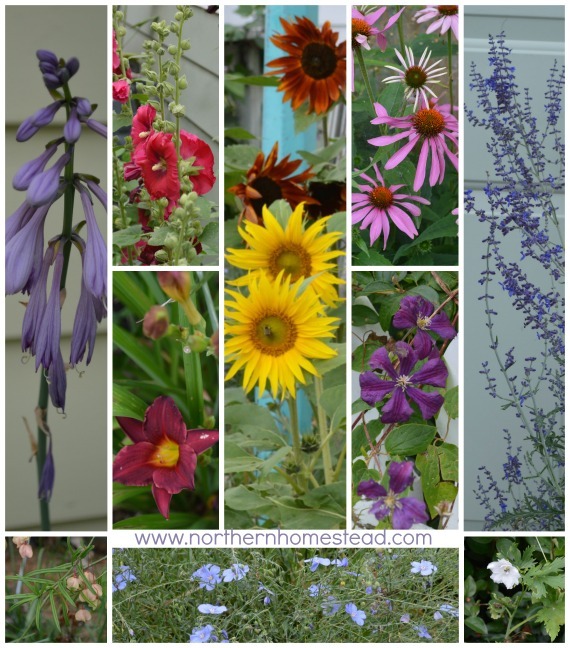 Your garden is amazing – Happy September gardening! We are very curious too. Thank you, we hope the killer frost waits a bit longer. I so love and admire your garden posts. Now that we moved, I have a tiny bit more space to plant stuff. Will definitely take some of your tips. I bet it is so nice to eat the foods you grow. Congrats on the new home and the garden space! You will love gardening! Oh, I’m interested in your potato hill experiment! Looks like everything is coming along quite well! Your cabbages are beautiful! I’m with you, this summer flew by! Looking forward to seeing how the potato experiment goes. Having all of your bounty grow together is a good problem to have but I’m with you. I wouldn’t want to go into it either, not even for those fresh cucumbers! Your summer is much shorter than ours. I know you and your family have been working hard all summer long. Hard work pays off! Congrats to the new college student! Thank you! I have to get used to not having her around all the time. I completely agree that mulching makes for much better soil! We us it throughout the garden and use different materials (straw, flax straw, champignon compost, cocoa shells…) but I reserve woodchips for perennial plants and paths because they tend to use up the soil nitrogen when decomposing – have you experienced any negative effects on the vegetables? No, not at all. The secret is not to till them in, just have them on top as a cover. And we love the fact that they hold moisture.